The 2017 Duane B. Gray Memorial Golf Tournament afternoon champions were Percy Zentz ’19, Ed Volkwein, David Taylor and John Richardson. The team had a gross score of 53. George Stevens Academy alumni, students, parents, faculty and friends took part in the event at the Blue Hill Country Club, which honors Duane B. Gray and supports the school’s Annual Fund. This year’s tournament is set for Sept. 8. BLUE HILL — The sixth annual Duane B. 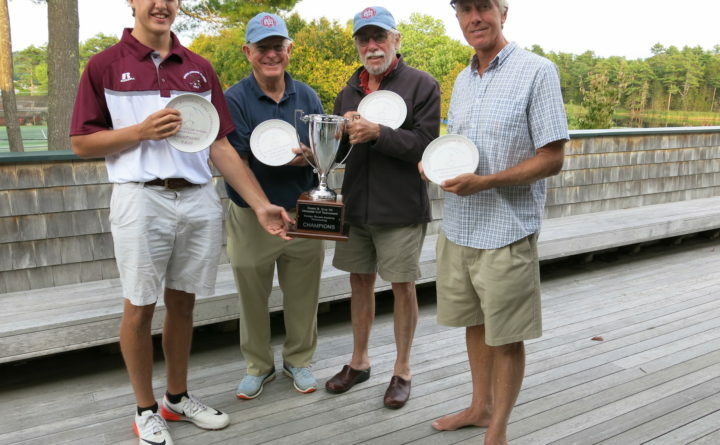 Gray ’64 Memorial Golf Tournament, hosted by George Stevens Academy, returns to the Blue Hill Country Club on Saturday, Sept. 8, for what organizers hope is a fun and friendly day on the fairways. Current students, alumni spanning six decades, parents, and friends of the school will hit the links in foursomes in the morning or in the afternoon to raise money for GSA’s Annual Fund and to honor Duane B. Gray, who died in 2012. Gray graduated as valedictorian of the GSA class of 1964, and in alternating years, served as president and vice-president of his class. He is remembered by many as an avid golfer and as “Blue Hill’s pharmacist.” Gray was the first pharmacist at Community Pharmacy of Blue Hill, a role now served by his nephew and GSA alumnus Tom Gray ’79. As an ongoing tribute to Duane Gray’s memory, Community Pharmacies is once again the lead sponsor of the event. Other supporters include hole-in-one sponsors Stanley Scooters and Darling’s, numerous local businesses serving as hole sponsors and contributors of prizes and services, loyal golfers, including several of Gray’s family members, and a group of dedicated volunteers. Last year’s morning champions were Rob Clapp ’73, Homer Lowell ’73, Mark Clapp ’03 and Ebb Walton ’08, with a gross score of 51. The afternoon champions were John Richardson, David Taylor, Ed Volkwein and Percy Zentz ’19, with a gross score of 53. The rain date is Sunday, Sept. 9. For information about the tournament, visit www.georgestevensacademy.org/DBGtournament2018.